Cranleigh acquired Fairtrade Village status over 5 years ago and the steering group is again preparing to renew this prestigious status. Two of our Rotarians are active in the steering group, and Gill Leslie has been active in starting a petition. The petition was initiated because Sainsbury has changed its position regarding Fairtrade goods. Instead of the funding being given directly to the poor farmers in the third world, Sainsbury's own version of 'Fairtrade', involves a middle man to whom the farmers have to apply for the premium and justify what it is to be spent on. This is in total contrast to the original concept of Fairtrade which was that the funds should be provided directly to the producing farmers to assist them in working their way out of their poverty. This petition is part of a national campaign taking place throughout Britain and is justifiably gaining momentum. One of the many requirements to maintain the village Fairtrade status is to hold events supporting Fairtrade. 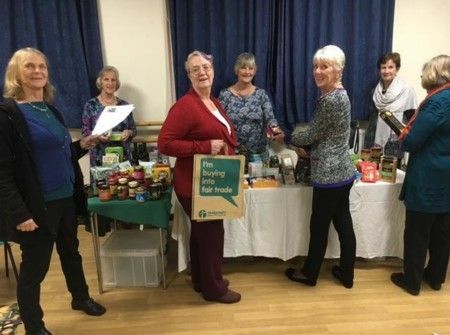 On Saturday, 22 October, a Fairtrade musical evening was organised by Sue Knight, with help from St Nicolas Church, to include a Fairtrade meal and the sale of Traidcraft / Fairtrade goods. £1,113 was raised to support a school in South Africa. It was a highly successful and enjoyable evening during which the petition was circulated and signed by in excess of 100 villagers. The photo shows Rotarian Gill on the left with her petition and Rotarian Jane O'Leary, in red, buying her Christmas Fairtrade cards and gifts.